The Friday evening street party by Muskegon's Hackley Park had perfect weather, all of the storms stayed to the north. 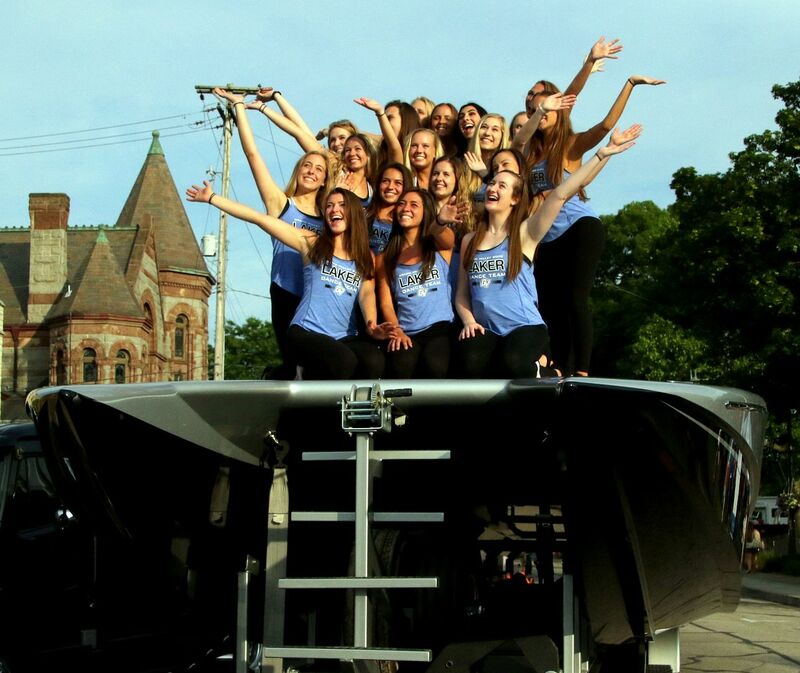 The food and drink provided by the Taste of Muskegon, live bands in the park, along with the ladies from Grand Valley State's "Laker Dance Team" made for a great evening. The number of people in attendance was incredible. Every boat there stayed surrounded by interested people from the 4:30 beginning until the boats were escorted out by the police at 9:30. Under way at 0017 to form in convoy and proceed to Beach inBaie de la Seine, Colleville, France. Anchored at 1352 in 8 fathoms of water. Under way at 1523 to proceed closer to beach. Anchored at 1530 off Omaha, Fox Red Beach, in Colleville, France. Under way at 1738 passing through breakwaer standing out of landing harbor, Omaha Beach, Colleville, France. Because of the rain, the board has decided to cancel the poker run, and will instead host a fun run at 4pm. We'll still head north to White Hall, down to Grand Haven, and then back to Muskegon. The evening festivities will proceed as planned. 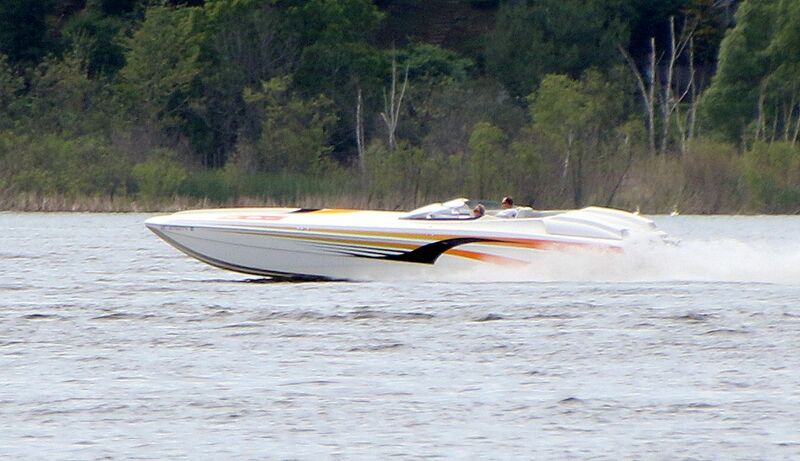 Amazingly, of the 85 or so boats originally registered, almost 50 boats stuck around and did the Fun Run/Poker Run. Talk about perseverance!! And everybody's attitudes stayed upbeat even though Mother Nature had made things a bit difficult. A few of the boats starting the run. After the run was over, the dinner and gathering proceeded as scheduled. 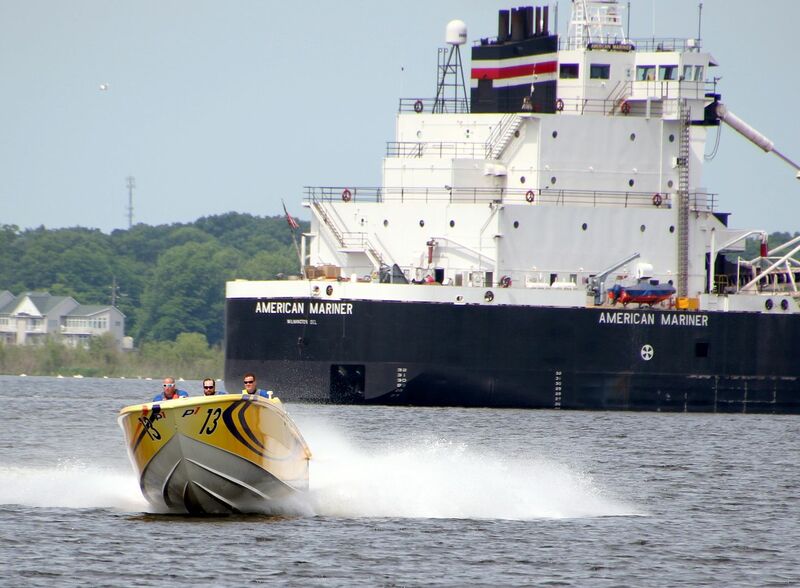 Even though the Poker Run itself had to be modified into a Fun Run, (due to the Card Stop boats not being able to stay on post through the storms). The cards were still drawn, and the winner was still announced at dinner as planned. The Best Hand champion, Alex in his 38' Top Gun, won with four Jacks!! Here are a few pictures of Alex and his crew joined into a collage. Considering the odds, a great event. Good people, combined with great attitudes, makes for a great event in spite of what gets thrown at them, perseverance! A special thank you from us all to those who sacrificed so much 74 years earlier so we could do things like this.